Number 25 in the Norman Rockwell inspired blog series. 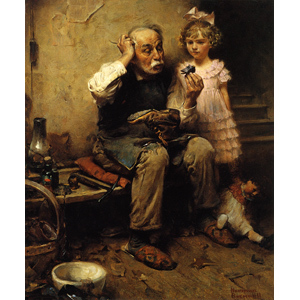 When I found this Norman Rockwell painting, I downloaded it to my Rockwell Blog Series, into a folder I named, "Trains." My original intention was to call the post Trains. Last night, I wrote the blog, in longhand, with a fountain pen, in my journal. Finished, I read and tweaked it a bit, and then I changed the title to Jessie. Here's what I wrote. Read it and you'll know why I did that. A couple of weeks ago, I wrote about my mother's father, Basil Carlton King, who I called Daddy King. Now I'll tell you about another equally amazing man in my life, Paw Paw, my other grandfather, you can call him Jessie. Paw Paw, wasn't my biological grandfather. He was, I suppose, my step-grandfather, if there is such a thing. My biological grandfather, on my father's side of the family, was Bert Carson (the first one), I am the third, and my son is the fourth. Bert Carson, the first, died at age 50 in an industrial accident. I'll tell you more about him in a blog I'll probably call "The Fighters." Paw Paw, a widower, with two sons, James and Ed, met and married Lily Carson, known to me as "My Mama." Lily was a widow, and, like Jessie, she had two sons, my father (the second Bert Carson) and Carl. Together they produced a daughter, Gwen. The seven of them became a hell of a family, living through the depression like it was an everyday event and, I suppose, in an important way it was. That way was, they were never broke or dispossessed. The children were a full-time job for my grandmother, and judging from the results, I'm confident when I say that she did her job well. Jessie's job was providing an income and housing for the family. He did his job as well as My Mama did hers. 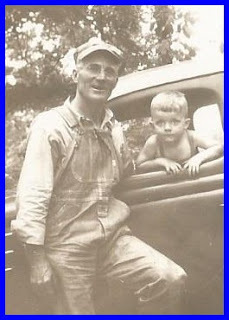 He started working for Southern Railroad, delivering telegrams, when he was fourteen years old. From the first until his last day on the job, almost sixty years later, he never missed a day of work due to sickness. At the time he died, he was the oldest operating engineer with the railroad. Thanks to his seniority, Paw Paw, and his four man crew, weren't "on the road." They picked up and delivered freight in the Birmingham area. That made it easy for him to take his grandsons, of which I was number three of seven, to work with him. I rode with him a number of times. On those occasions Mother or Daddy delivered me to my grandparent's house where I had breakfast with My Mama and Paw Paw. I have no recollection of those meals. I was way too focused on the upcoming day. I stayed with him and his crew until late morning, when we reached the crossing at 1st Avenue. There, Paw Paw would put me on the bus that took me home. It's pretty awesome for a little kid when his grandfather stops his train at a crossing, waits for the right bus, then swings out of the cab and flags it over to the side of the street. That's not all he did. He walked back to the engine, lowered me to the ground, walked beside me to the bus, and then swung me up beside the bus driver. At that point, he always said the same thing to the bus driver, "This is my grandson, Bert Carson, he is a special young man. Here's his address." The he paused, reached into the bib pocket of his overalls and pull out a slip of paper, glanced at it to confirm it was the right one, then handed it to the driver, as he continued, "His house is on your route. I'd appreciate it if you'd stop there and let him off. His mother will be waiting for you." The drivers always looked up from the paper at that point, took the fare he handed them, and with utmost respect, simply said, "Yes, Sir. I'll take care of it," often adding, "It will be a pleasure," or you can count on it." For years I thought that happened because he was the train engineer. Now I know better. Those train rides happened more than sixty years ago, yet they remain vivid memories. Here's why. What I remember most isn't the operation of train, blowing the whistle, leaning out the window, or even having the bus flagged down on my account. The memories that override all of those are the memories of witnessing the power in the presence of Jessie Powers. On the job, he wasn't Paw Paw, he was Jessie Powers, the senior operating engineer of Southern Railroad. From the time we entered the building which marked the beginning of our trip, we were greeted and trailed by a chorus of greetings; "How are you, Jessie, " "Good morning, Jessie," and "Who is your friend, Jessie?" He acknowledged each person, like a benevolent king moving through a throng of his people, and he stopped often to introduce me. Later, with me, and his crew, he reviewed the work they were scheduled to accomplish that day, and at each task he gave the plan they would execute to complete the task. That accomplished, the engine was started, and with the fireman, the three of us performed an exacting walk around inspection of the engine. When he was sure that everything was alright, he lifted me up to the cab, and climbed up behind me. In the tight confines of "his office," he lifted me onto his seat, where I watched while he and the fireman, performed a meticulous in-cab inspection. From my perch, I could see other train crews outside, performing the same routine, but even at my age, I knew it wasn't the same. Something was missing. It was years before I figured out what it was. I'm not a slow study. The delay was probably a result of having the good fortune, in my early years, to be with some awesome men - men who were larger than life. Men who molded and shaped life to fit them rather than conforming to circumstance. Jessie Powers was a force in his world. He was a positive force for all that was good, and true, and right. Everyone who worked with him felt it and came away a better person thanks to the time they had spent together. Today, I don't have a problem understanding the force that Paw Paw was in the world even though today it is a rare, seldom seen force. We could use a whole lot more like Jessie Powers today. "We act as though comfort and luxury were the chief requirements of life. All that we need to make us happy is something to be enthusiastic about." You were extremely lucky, Bama, to have had some really awesome men to look up to in your life! How I wish every child had that history. This is a wonderful story!! I've had a few shocks in my life. One of the biggest was to discover everyone of my friends didn't have the father and grandfathers that I had. Maybe the universe figured I'd need all the help I could get. We could use more people like Jessie Powers, and more stories like this. Reading this put the world back on its axis for me today. Thank you, Bert. I am honored my friend. It's great to hear from you. Stay close and have a wonderful year. You have been a wealthy man all your life Bert - thank you for sharing that wealth with us! You are definitely part of my wealth. Thanks for the comment. To be born into this line of men was obviously no accident, Bert. To have memory and appreciation of them is certainly a gift. Thank you for sharing that gift, and reminding us of their strength and honor. It took years for me to appreciate them because I thought everyone had a group just like them.